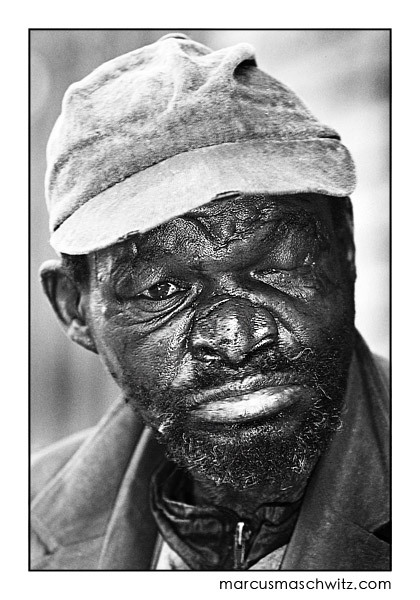 In 2001 during my photography studies, I was working on my portfolio and I remember clearly wanting to photograph this man because of his unique features. He was a homeless man that walked by my fathers work every day completely drunk and saying the funniest things ever. He had a trolley (shopping cart) with all his belongings in and he always carried around a bottle of metholated spirits which he either used to sniff or drink. Anyway, in May 2001, I had the chance to photograph with him and chat with him for a bit and he just kept mumbling the funniest things and laughing and even though I felt really awkward, it went well. I was shooting then with my Nikon F90X camera (amazing) and I had no idea if I was shooting rubbish and I only had one roll of film with me that I had hand loaded so I was really hoping for the best. I went right home to process my negatives to make sure they were alright and this frame explained it all. Sadly, my dad called me the next day to say that the guy fell down just across from his shop and that after a few hours an ambulance came and took him away and we never saw him again. I presume that he passed away that day and I am sure that I was the last person to photograph him. I thought I would share. Enjoy life, it goes by quicker than you think.